This recipe from the coastal town of Malvan in the Konkan region of India is all the rage these days! Malvani cuisine has become quite the rage in India in recent years. I wonder what took people so long to discover this distinctive cuisine! I grew up with Malvani cuisine because my ancestors come from the Malvan Vengurla region of India. These scenic coastal towns are well known for their white sand beaches, their coconut groves and of course the fish. Malvani cuisine uses coconut liberally. Coconut is used in it’s various forms like freshly grated and shredded dry coconut, coconut milk and coconut oil. Spices such as coriander seeds, red chilies, cloves, cinnamon and black peppercorns are commonly used. Tamarind and green mangos are used as souring agents. Of course, this is a recipe I had learned from my mother! 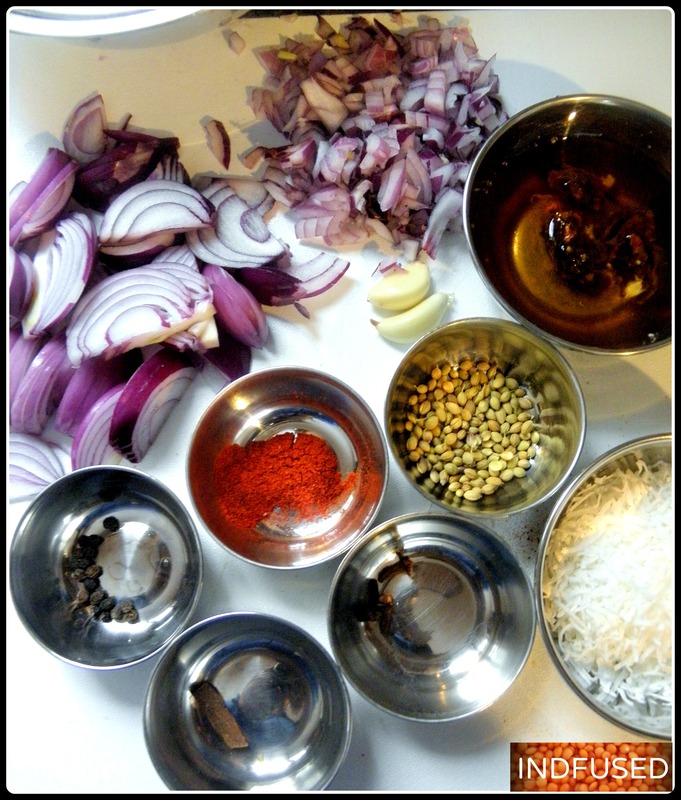 Watching her roast the masala mixture just so that the dry grated coconut and the sliced onion is golden, the aroma as the freshly roasted spices were ground with the coconut mixture and me sneaking in to sample the warm, delicious and fragrant masala is a vivid memory for me. I try my best to emulate her but know that I have a long way to go. The same thing goes for my writing skills. My dad has a gift for writing and I want to learn the skill of writing as well. Remember how I told you that he would write all my speeches when I was little? All I did was memorize and recite them 🙂 Yesterday was my Dad’s birthday. His favorite dish is the Malvani kheema which is made by using the same masala. Being thousands of miles away from him I could not make it for him. I missed him as I made the masala to make chicken instead of the kheema as we were shut in during a snow blizzard in the Boston area. 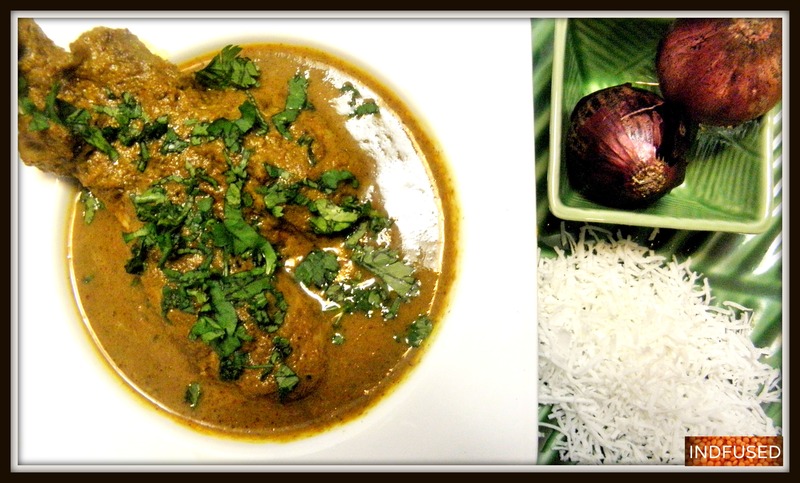 The Malvani Chicken curry warmed us as we watched the snow fall and blow outside the window! 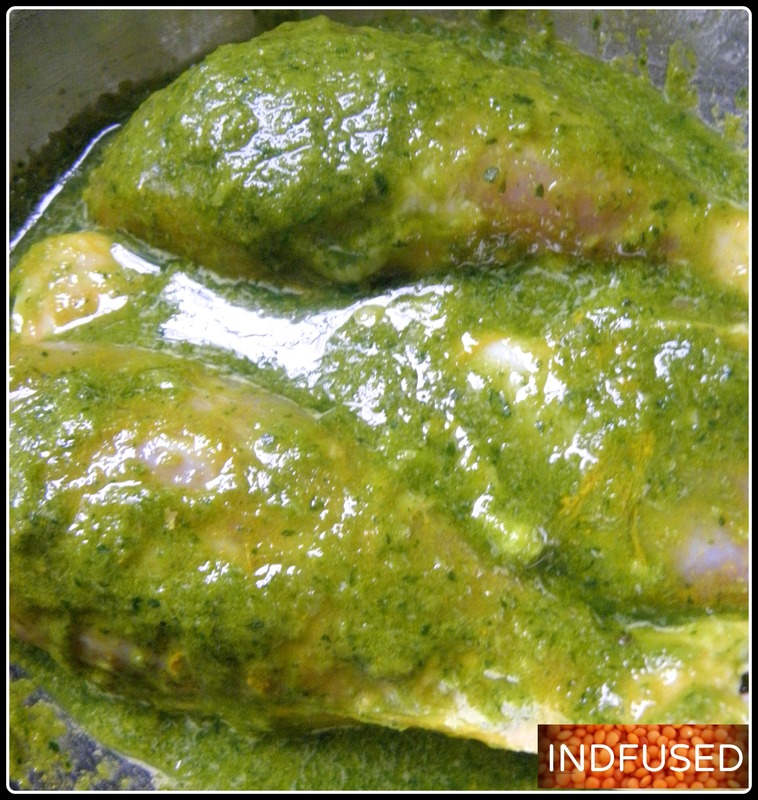 To marinate the chicken, grind together the ginger, 2 of the garlic cloves, cilantro and the green chili. Remove to a bowl. Add the turmeric powder and salt. Mix well and add the chicken. Coat chicken with the marinade. Cover and set aside. 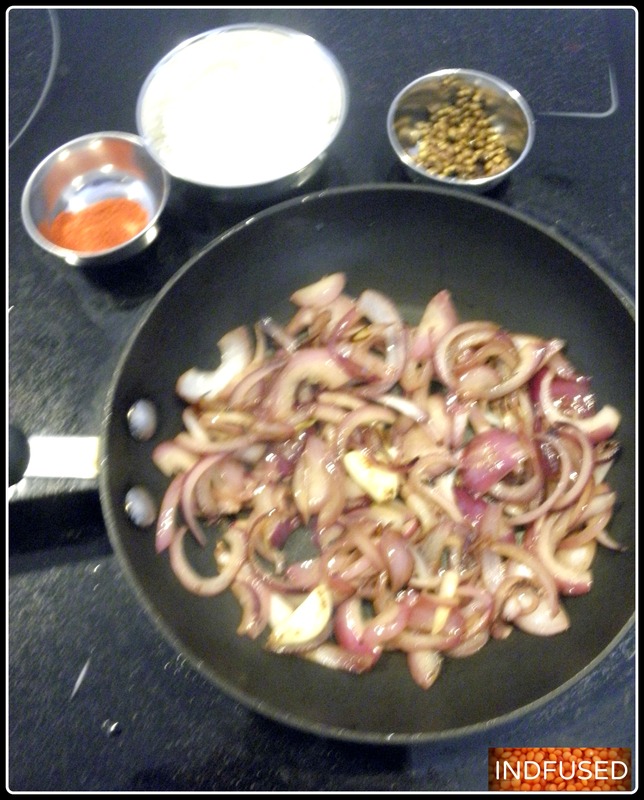 Meanwhile, to make the masala, heat 2 teaspoons of the oil in a frying pan over medium heat. Add the coriander seeds and fry them for about 30 seconds or until they turn slightly darker and are fragrant. Add the peppercorns, cloves and cinnamon and fry for a few more seconds until the spices ‘swell up’. Remove the spices from the pan with a slotted spoon and set aside. To the remaining oil in the pan, add the 2 sliced onions and the 2 garlic cloves. Fry them until the onion starts to caramelize. Add the shredded dry coconut and roast it until golden brown. Turn off the heat and add the chili powder and roast an additional 30 seconds. Grind the mixture with the roasted spices and the tamarind pulp using as much is needed out of the 1 cup of water. In a separate pan, heat the remaining 2 teaspoons of oil over medium heat and add the diced onion. Fry it until translucent and add the marinated chicken. Let it cook on each side for about 30 seconds and then add the marinade, the ground up coconut mixture and the remainder of the 1 cup water. 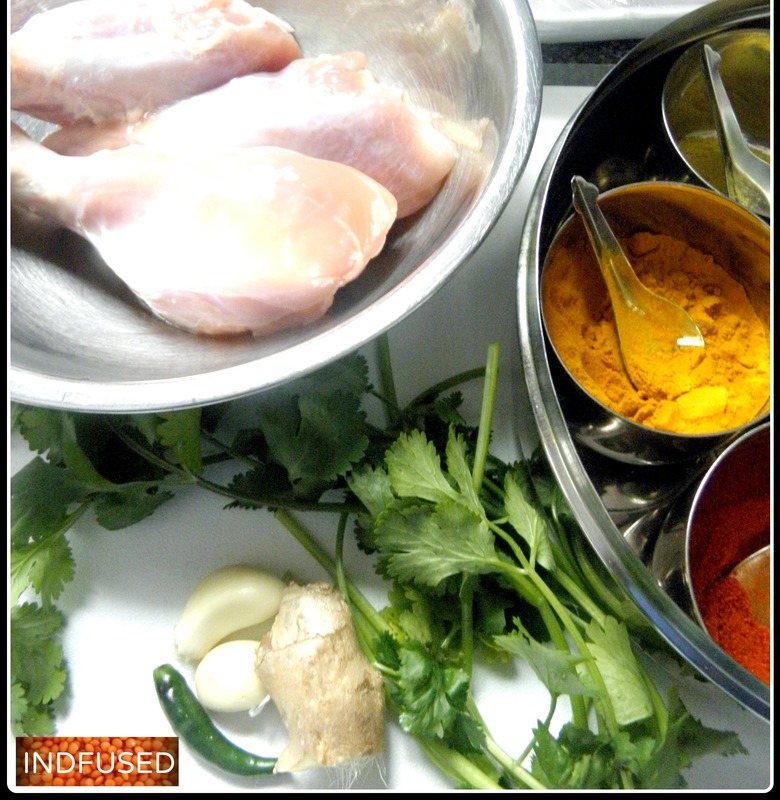 Add salt and let the curry cook covered, until the chicken is cooked. Add the coconut milk and let the mixture come to a low simmer. Turn the heat off, sprinkle with the chopped cilantro and serve with lemon wedges on the side. I feel that this curry tastes even better the next day. So I make it a day in advance and serve it with chapatis or rice and the creamy and cool onion raita. I hope you enjoy this heirloom recipe as much as I do! Thank you so much for your kind words and your wishes for my Dad. yes the best recipes are from mom, of course! Thank you so much for your sweet compliments. It means the world to me! Thank you so much Jayeeta! let me know how you like it. I am so glad you liked it! Thank you so much. Eeeeek! This is going to have to go in my list of recipes to try! Thanks for sharing it at #MonthlyMasala!